There will be farm tours & visits with our alpacas! Two of our alpacas will be attending this year! Come relax with us and get a break from the craziness of the Mall and traffic. Nothing relieves stress better than feeding an alpaca! Farm tours are always available when visiting our store! 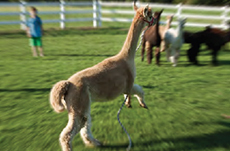 Bring the whole family for a memorable visit with our alpacas, goats, and more!